The guest country for Cologne Fashion Days 2014 was the Netherlands and FASHIONCLASH was invited to present emerging Dutch designers. Within the „Think Dutch Space”, diversity, innovation and creativity of Dutch fashion design was on display. Presentation showcased fashion in the broadest sense of the word, next to fashion design there was shoe design, textile design and accessories. On Saturday, November 16 the forth edition of Cologne Catwalk took place with a fashion show that featured Judith van Vliet x Chris van den Elzen and Jivika Biervliet in collaboration with designer Peter Hsieh and shoe designer Ruben Lekkerkerker. Chris van den Elzen & Judith van Vliet are winners of Cologne Catwalk Award 2014. The guest country for Cologne Fashion Days 2014 is the Netherlands and FASHIONCLASH is invited to present 10 emerging Dutch designers. Within the „Think Dutch Space”, diversity, innovation and creativity of Dutch fashion design will be on display. The presentation will show fashion in the broadest sense of the word, next to fashion design one can find shoe design, textile design and accessories. Selection of designers includes award winning talents like Liselore Frowijn (Prix Chloé at Hyères International Festival de la Mode 2014) and shoe designer Deniz Terli (Clarks Shoe Design Award). Furthermore one can discover fashion by Joelle Boers, Ebby Port, by Sanne Jansen and menswear design of Mevan Kaluarachchi and Jivika Biervliet. Judith van Vliet and Chris van den Elzen joined forces with success at FASHIONCLASH Festival 2014 and now their innovative work will be exhibited at Cologne Fashion Days. Judith van Vliet will show her fashion collection and Chris van den Elzen his stunning shoe collection. Special feature within the space will be filled with work by already known name in the fashion scene, Bas Kosters, who is a great example of multidisciplinarity and artistic freedom. All participants have already presented their collections on stages in The Netherlands (Amsterdam Fashion Week, FASHIONCLASH Festival) and abroad (London Fashion Week, Vienna Fashion Week). On Saturday, November 16, the 4th edition of Cologne Catwalk takes place with a fashion show that features Judith van Vliet x Chris van den Elzen and Jivika Biervliet x Peter Hsieh. 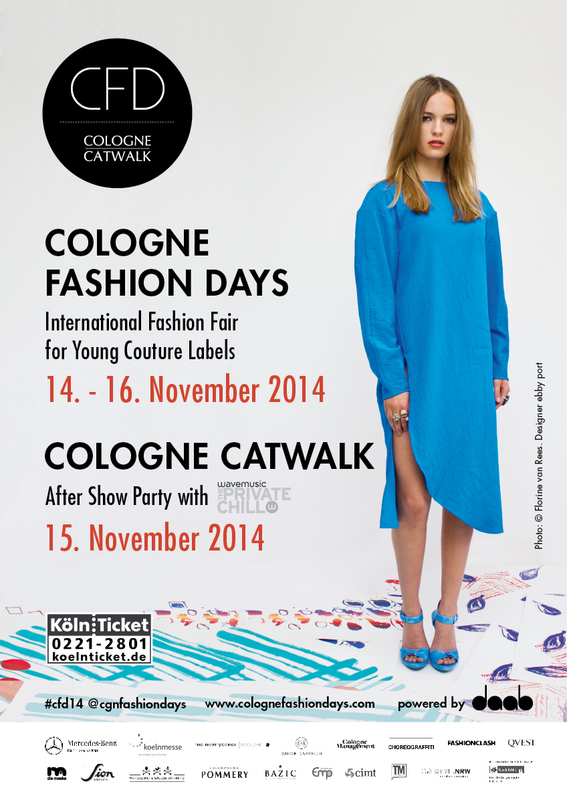 FASHIONCLASH invites you to come to Cologne and discover new generation of Dutch fashion talent. COLOGNE FASHION DAYS 2014 - The New Fashion Format in Cologne More than 30 national & international Young Couture labels present and sell their latest collections. The long-awaited premier of the CFD | COLOGNE FASHION DAYS 2014, a three-day trade fair for fashion enthusiasts, will take place in THE NEW YORKER | DOCK.ONE in Cologne-Mülheim from the 14th through the 16th of November. The CFD will also provide a brilliant and promising framework for the 4th edition of the highly successful COLOGNE CATWALK, which will take place on the 15th of November. The COLOGNE FASHION DAYS and the COLOGNE CATWALK both take place under the patronage of Garrelt Duin, Minister for Economic Affairs, Energy, Industry and Commerce of the State of North Rhine-Westphalia. As organizer of both events, Ralf Daab and the team of the Cologne-based publishing house DAAB are particularly pleased about the cooperation with TM TextilMitteilungen, the visionary dialogue-magazine for fashion professionals and FashionUnited, a leading international industry network for fashion professionals. The CFD is aimed at ultimate consumers, while also serving as a PR and marketing platform for young designers and emerging talents. Buying agents are, of course, also welcome. Here, they can discover innovative fashion labels and order trendy new collections for their shops. With its cool industrial charm, DOCK.ONE in the Mülheim Harbour is an ideal event location for the new trade fair. More than 30 fashion labels from Germany and abroad will present their latest collections and sell these directly to consumers. In addition to innovative designers from Germany and numerous international labels, including among others, BRACHMANN, LAROMO + PADICI or JOLONTÉ VOUS!, the local Cologne fashion scene is represented by the likes of, among others, CHANG13 and LIEV by Olivia Zirkel. Special guest country this year is the Netherlands. In cooperation with the internationally active, fashion platform FASHIONCLASH from Maastricht, the Netherlands are presenting a choice selection of ten Dutch designers, including BAS KOSTERS, ebby port, Deniz Terli and Liselore Frowijn, in the THINK DUTCH SPACE. On all three fair days, an interesting supplementary program will present lectures, interviews and talks revolving topics from around the world on the CFD Stage. Finally, fashion schools will also provide information on their educational programs like Design Department from Düsseldorf.